Boomers is a new BBC One comedy series following the ups and downs of a group of newly retired couples living in a seaside town in England. The six part sitcom stars many familiar faces including Russ Abbot (Last of the Summer Wine, September Song), Stephanie Beacham (Trollied, Love and Other Disasters), Philip Jackson (Poirot, My Week with Marilyn), James Smith (The Thick of It, The Iron Lady), Alison Steadman (The Syndicate, Gavin & Stacey), June Whitfield (Terry and June, Absolutely Fabulous)and Paula Wilcox (Mount Pleasant, Emmerdale). After filming the pilot episode in Herne Bay in 2013, the Boomers production team once again visited Herne Bay in May 2014 to film exteriors which doubled as a fictitious Norfolk seaside town. Filming location­­s included the bandstand where they filmed an open day celebration with Morris dancers as well as Central Parade and Studd Hill. The production also made use of the Kent Film Office’s Filming on Highways Act 2010 where they used traffic management at Central Parade to film a driving and parking sequence. Herne Bay is located on the Kent coast and boasts a delightful beach with a bandstand and seafront gardens as well as many shops and eateries, amusement arcades, and a windmill. Previous productions which have filmed in Herne Bay include Big Bad World (2013), Got To Dance (2012) and Things I Haven’t Told You (2008). 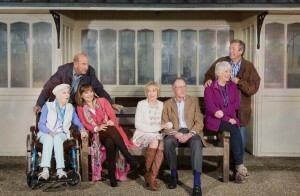 Don’t miss Boomers which starts on BBC One at 21:00 on Friday 15th August 2014. This entry was posted in Filmed in Kent and tagged Allison Steadman, Boomers film locations, Herne Bay, James Smith, Paula Wilcox, Philip Jackson, Russ Abbot, Stephanie Beacham, tv entertainment. Bookmark the permalink.